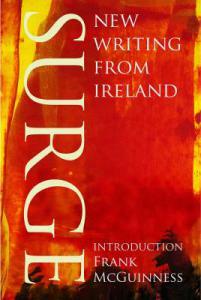 The cover of Surge is fiery looking, as befits an anthology of new writing. The volume from Brandon Press is a celebration of the old and the new; its publication marks the 40th anniversary year of O’Brien Press and is named after a Dublin literary magazine of the 1930s/40s established by Thomas O’Brien, among others. (Thomas founded O’Brien Press in 1974.) The name may be old but the content is all new. It contains work hot off the keyboards of a dozen or so student writers from all over Ireland.